Check with your school and if possibly supervise a lunch to see how long kids have to eat lunch and why your child is struggling. Some kids are encouraged to finish quickly to go out to play leaving pokey eaters in a tough predicament. Hold your school accountable by advocating for adequate lunch eating time (at least 20 minutes before anyone is dismissed). After all, limited nutrition means limited ability to learn. Pasta salad with leftover meat or black beans, cheese, veggies and dressing; side of grapes or sliced fresh fruit. Thermos filled with a smoothie (made with milk, yogurt, and frozen fruit); cold pizza bagel with veggies and cheese. Leftover pancakes or waffles served cold with cream cheese and jam; dried fruit and hard cooked egg. 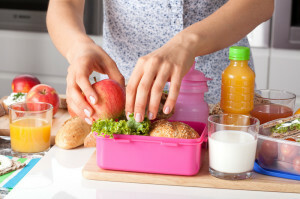 Try a bento box full of nutritious snack foods such as: hard cooked egg, seeds (if permitted), muffins/mini-muffins, whole grain crackers, fruit (such as grapes, berries or sliced apple with lemon juice to prevent browning), dried fruit, raw veggies (such as grape tomatoes, snap peas or carrots), cheese cubes, yogurt or cottage cheese. Get them involved! After supper, get the kids involved in lunch packing. Don’t ask them what they would like to have, as you may not like the answer. Instead, offer them two healthy choices and let them decide. For example would you like mini pita pockets or rye crackers? Would you like cantaloupe or strawberries? Should we put the meat on your sandwich or in a container on the side.? Make Udi’s Fantastically Fluffy French toast using rice/soy milk. Once cooled cut into squares and skewer on kabob sticks threaded with grapes, berries and melon. Alternatively serve this bento-box style with toothpicks: once large container that fits a collection of smaller containers: one filled with the French toast bites, another filled with cut up fresh fruit and another filled with maple syrup or jam for dipping.